Organizations of all sizes, profits, or nonprofits have adopted one form or another of Enterprise Resource Planning (ERP) applications. ERP systems are increasingly becoming a business enabler for organizations to remain successful and competitive in this turbulent and networked environment. ERP systems are enterprise applications affecting many aspects of the organization both internally and externally. Therefore, successful ERP adoption and its effective usage and utilisation are critical to the success of the organization’s performance and survival. ERP implementation can be viewed as an organizational transformation endeavours, it imposes socio-technical transformation of the organization, and it involves a large number of stakeholders who may influence the success or failure of an ERP project. Boonstra (2006) in his study on the influence of stakeholder on ERP implementation argues that stakeholders have different interpretation of ERP systems and this may lead to differences about priorities and ways of implementations. Stakeholders are affected by the previous experience, interests, self-images, and prospects and views. A typical ERP application may consist of 1,000 modules and 10,000 application program (Steven, 1997). The cost for deploying an ERP can range from 3 million to one billion dollar depending on the company’s size, and the implementation may last up to 4 years (Chen, 2001; Weston, 2001). ERP projects can take years to implement and like other IT projects they are subject to budget over-runs, delayed deliveries and as a fatal consequence falling short of meeting expectations or abandoning the project altogether. Trunick (1999) states that only 40 percent of ERP implementations are effective and 20 percent have been abandoned. Numbers of other studies have argued that ERP failures have been reported more than 50 percent and 60 to 90 percent are not performing as expected (Scheer & Habermmann, 2000; Sarker & Lee, 2003; Escalle, et al., 1999; Trunick, 1999; Ptak & Shragenhe, 1999; Soh, et al., 2000). No one seems to be immune from an ERP project failure, Dell for example; after two years, they have abandoned their ERP project because of incompatibility with their business model. Others, like FoxMeyer, did not have the time to abandon their ERP project instead they filed for bankruptcy in 1996 (Davenport, 1998). Interestingly, most often managers view ERP projects failures as technical while in fact at 50% of the failures are attributed to people related issues such as resistance to change, lack of appropriate training, awareness, and / or understanding the organization culture. The organization culture is probably the most difficult hurdle in the implementation of an ERP since it involves a complex marriage between people personal values, habits, skills and the business processes and how staffs are viewed. Ward et al. 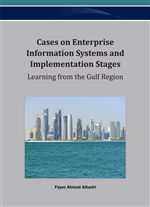 (2005) argues that organizational issues during enterprise applications implementations are more difficult to resolve than the technical ones. ERP research continued to attract practitioners and academics interest to determine ways to engineer successful ERP implementations. Research into ERP at any given time of its life cycle is considered including, evaluation of software, effective user training or determining critical success factors. For a compilation of critical success factors, see Sherry and Martin (2007) for 26 categories of CSF grouped by either strategic or tactical. The most reported CSF is top management commitment support (strategic), change management (strategic), BPR and software configuration (tactical), training and job design (tactical). An overstressed issue in the ERP implementation is to view ERP project as a business rather than technical solution. Reasons for failure have been attributed to poor planning, lack of user involvement and training, delays, over budgets and lack of skills (Summer, 2000; Umble & Umble, 2002; Wright & Wright, 2002). Resistance to change is also another main contributor to project failures; a study of 186 companies that implement enterprise system revealed that the second most important contributor to project overruns is resistance to change and it is the fourth factors that limit successful systems adoption (Cook, et al., 1998).